CAA invites nominations and self-nominations for one member-at-large to serve on the Publications Committee for a three-year term, July 1, 2017–June 30, 2020. The Publications Committee is a consultative body that meets three times a year. Through its chair, the CAA vice president for publications, the committee advises the CAA Publications Department staff and the CAA Board of Directors on publications projects and meets with chairs of the editorial boards of The Art Bulletin, Art Journal, and caa.reviews three times each year. 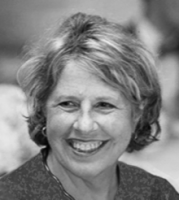 The committee chooses candidates to serve on CAA’s book-grant juries; sponsors a practicum session at the Annual Conference; and, with the CAA vice president for publications, serves as liaison to the board, membership, editorial boards, book-grant juries, and other CAA committees. Each year the committee meets twice in the spring and fall and once at the CAA Annual Conference in February. Members pay their travel and lodging expenses to attend the meeting at the conference. Meetings in the spring and fall are currently held by teleconference. Members of all committees volunteer their services to CAA without compensation. Candidates must be current CAA members and should not serve concurrently on other CAA committees or editorial boards. Applicants may not be individuals who have served as members of a CAA editorial board within the past five years. Nominators should ascertain their nominee’s willingness to serve before submitting a name; self-nominations are also welcome. Appointments are made by the CAA president in consultation with the CAA vice president for publications. 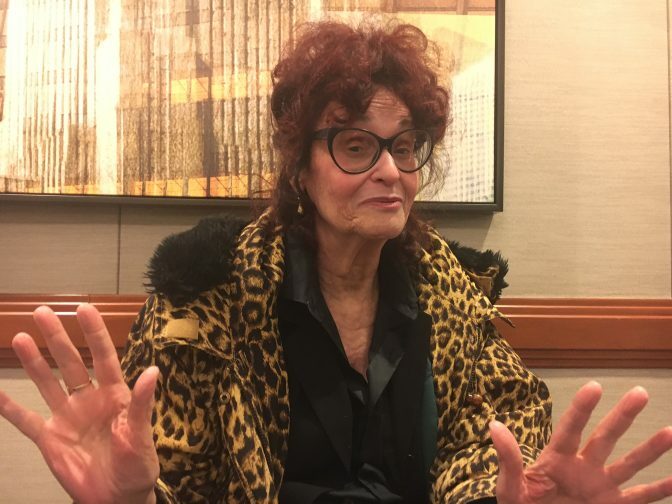 Please send a letter of interest, a CV, and your contact information to: Vice President for Publications, c/o Deidre Thompson, College Art Association, 50 Broadway, 21st Floor, New York, NY 10004. Materials may also be via email to dthompson@collegeart.org. Deadline: April 21, 2017. CAA invites nominations and self-nominations for three individuals to serve on the caa.reviews Editorial Board for four-year terms, July 1, 2017–June 30, 2021. Candidates may be artists, art historians, art critics, art educators, curators, or other art professionals with stature in the field and experience writing or editing books and/or exhibition reviews; institutional affiliation is not required. The journal also seeks a librarian to serve in an ex officio capacity to advise the editorial board on technical and distribution issues. CAA encourages applications from candidates with a strong record of scholarship who are committed to the imaginative development of caa.reviews. An online journal, caa.reviews is devoted to the peer review of recent books, museum exhibitions, and projects relevant to the fields of art history, visual studies, and the arts. The editorial board advises the editor-in-chief and field editors for the journal, and helps them to identify books and exhibitions for review and to solicit reviewers, articles, and other content for the journal. The editorial board guides the journal’s editorial program and may propose new initiatives for it. Members stay abreast of trends and issues in the field by attending and reporting on sessions at the CAA Annual Conference and academic conferences, symposia, and other events in their fields. The caa.reviews Editorial Board meets three times a year, twice in the spring and fall and once at the CAA Annual Conference in February. Members also attend the annual meeting of the caa.reviews Council of Field Editors at the Annual Conference. Members pay their travel and lodging expenses to attend the meeting at the conference. Meetings in the spring and fall are currently held by teleconference. Members of all editorial boards volunteer their services to CAA without compensation. Candidates must be current CAA members and should not currently serve on the editorial board of a competitive journal or another CAA editorial board or committee. Nominators should ascertain their nominee’s willingness to serve before submitting a name; self-nominations are also welcome. Please send a statement describing your interest in and qualifications for appointment, a CV, and your contact information to: caa.reviews Editorial Board, College Art Association, 50 Broadway, 21st Floor, New York, NY 10004; or email the documents to Deidre Thompson, CAA publications assistant. Deadline: April 21, 2017. Art Matters. Art has always mattered. Whether we are art scholars or artists, critics or designers, gallery goers or museum professionals, art matters to all of us a great deal. Equally importantly, art matters – critically – to the societies in which we live and work. Fifty years ago this week (February 14,1967) as Aretha Franklin recorded her soon to become hit song, Respect, and Martin Luther King, Jr. prepared to denounce the Vietnam War in an April 4th New York city religious service, Faith Ringgold was creating her celebrated Black Light series, addressing the impact of race riots and other issues of the era. 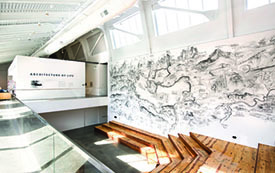 More recently, in 1990 when South African Apartheid finally ended, and Nelson Mandela and other political prisoners were released from incarceration, the important work of South African artists – black and white, men and women –in bringing inequality and racism into public view began to be broadly acknowledged. Within the last few weeks, the Museum of Modern Art began a project to rehang works by artists from majority-Muslim nations facing travel bans to this country. Art matters. As the one hundred and fifth College Art Association’s Annual Conference gets underway, it is imperative that we reflect on these and related art issues, on the close connections between art making and activism and the vital roles that artists, art scholars and other professionals play in tackling critical issues of the day, whether it be war, racism, sexism, or other forms of discrimination and ethical derogation. Art Matters. It serves as a vital site not only of engagement and resistance, advocacy and education, problem solving and invention, but also as a vital means of opening up and re-envisioning the world around us. Art matters to us both as individuals and as part of the societies in which we live and work. 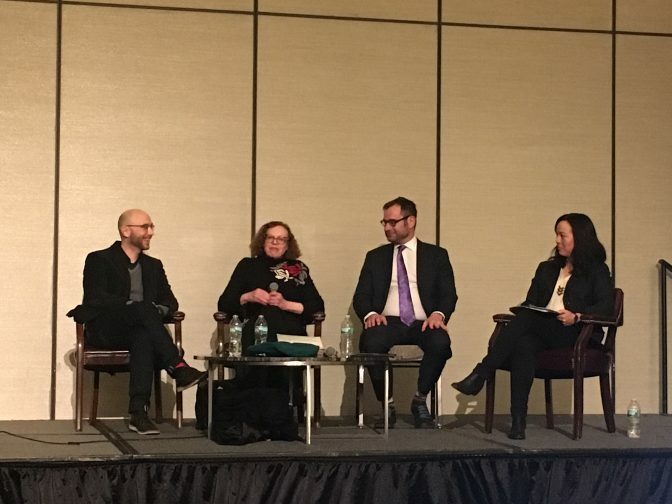 In an era of increasing attacks not only on the humanities, social sciences, and sciences, but also on the arts, the importance of CAA as the leading organization that brings together practitioners and scholars within the same broad umbrella is all the more important. 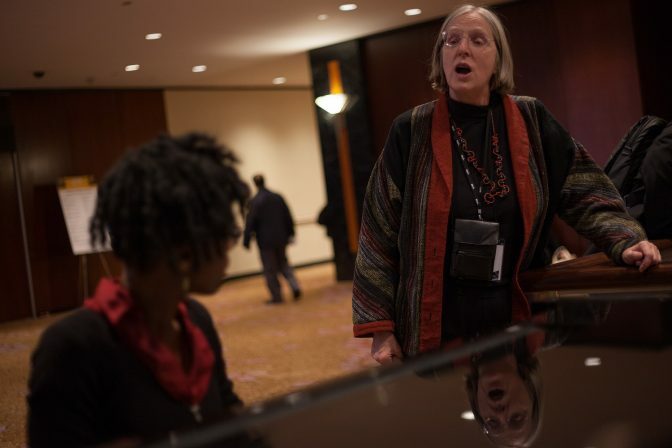 CAA offers a unique platform to reengage at the local, national, and international level. The so-called STEM fields (science, technology, engineering and math) are important, but they do not overshadow the arts and humanities. Indeed, throughout history, each has often enhanced the other. Arts Matter. Yet I have a confession: there was a key moment in my life when I did not feel this. It was the summer after my Freshman year in college at the University of Vermont. I was working in the Senate when one bleak morning I found myself in tears standing in Dupont Circle watching as Bobby Kennedy’s body arrived here in the hearse after his assassination. Martin Luther King Jr. had been shot a few months earlier. I returned to college that Fall but concluded soon after that art history and studio art were simply not enough. I quit college at the end of that year to join the Peace Corps. It was here, in Africa, where I first realized politics and art were integrally co-joined. Every book I read on African art was worse than the last. The field needed a correction, art history needed a correction, and after my two-year term ended, I returned home to finish my degree and make plans to attend graduate school with a focus on African art. CAA then, as today, was a big deal. Elation and genuine fear were my initial emotions when my first CAA paper proposal was accepted– on a politically fraught panel addressing Semiotics and Art chaired by Henri Zerner. Much later we would become colleagues. These kinds of connections are part of what makes CAA so important. For me, a timely Art Bulletin article no doubt helped with tenure. But well before then I felt it was important to engage more formally with CAA – as much for African Art as anything else. It was for that reason that I ran for the CAA Board of Directors – and years later ran a second time. When I was a graduate student, many still believed that Africa had no arts outside of Egypt, and Egypt itself was part of a strange exo-African nether world somewhere between Mesopotamia and Greece. African art, if it was considered art at all, was assumed to be primitive. 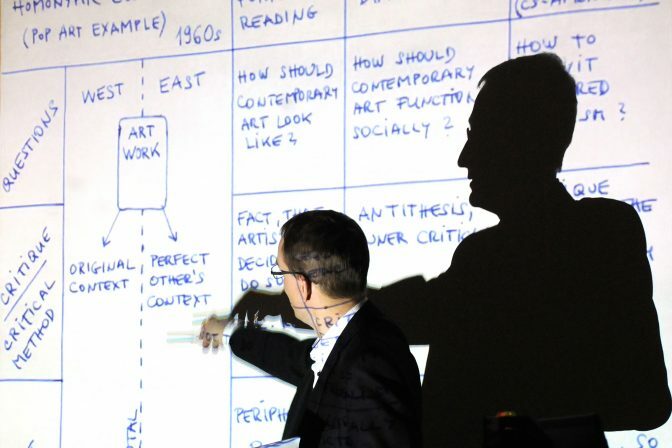 CAA for me was where the real political work began, through CAA board connections, I and others persuaded the editor at Abrams to drop the “Primitive Art” chapter from Janson’s best-selling History of Art textbook. 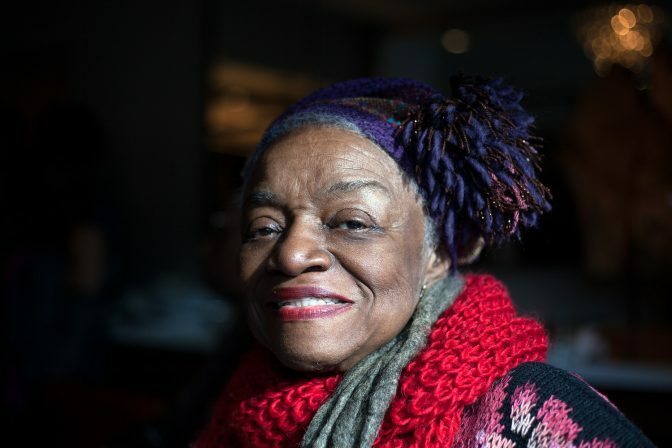 In due course, African and African diaspora arts, and those who made and studied them, began reshaping not only art departments around the country, but also exhibitions, major journals, book publications and key prizes within CAA and other organizations. It was CAA that played a central and ongoing role in this. What had begun for me at CAA as an engagement about my field, soon blossomed into other issues – open access to museum collections in publishing for example. When I was a board member initially, one of our group began to work with the Metropolitan Museum to make their art photographs accessible on the web. This effort continued and on February 7th, one week ago, the Metropolitan announced that all images of public-domain works in the Met collection will now be available under Creative Commons. This is a huge step forward that will benefit us all. So too has been CAA’s path-forging efforts on Fair Use one of our most important and indeed revolutionary undertakings, for which I and others already are seeing considerable savings in terms of finances and time. Art Matters. CAA members working together have achieved important ends. But we can and must do more. Art access inequality is not the only issue to attend to. Access to quality higher education is a vital concern for both us and our students, as are questions of student loan fees and affordability, along with the ability of professionals in our field to gain a viable living and secure employment in educational and art-linked institutions. I benefitted from my undergraduate training at a then inexpensive public university; my graduate school education would not have been possible without affordable student loans. I could not have written my Ph.D. without a government funded Fulbright fellowship. For me and many others, book projects would not have been completed without an NEH grant or others at tax supported institutions such as CASVA, the Clark, and the Getty. Museum exhibitions funded by both NEA and NEH are critical to what we do, and these same museums bring in billions of dollars in revenue to local cities and towns. Art matters. And this is where CAA is critical as an organization, focusing with a new sense of urgency not only on the longstanding programs where we have excelled but also speaking out on core issues that are important to all of us – such as diversity, equal access, and sustainability. Social Activism is a key part of CAA’s Strategic Plan now. As we move forward, changes in CAA that are already underway and will become more evident shortly will help make our organization even stronger and more engaged – from the reenergized annual conference, to a far more dynamic web presence, from larger roles for our affiliated societies, to added benefits that will help members in their professional and personal loves. Art Matters. It matters to us. It matters to the communities and broader societies in which we live and work. Danny Smith visits Architecture of Life, the inaugural exhibition in the new building of the University of California, Berkeley Art Museum and Pacific Film Archive. Presenting a “sweeping, cacophonous vision,” the show conceives “of architecture as the organizing principle of everything from reality to society and human relationships,” making it “a compelling examination in homemaking.” Read the full review at caa.reviews. Kimberly L. Dennis reads Old Women and Art in the Early Modern Italian Domestic Interior by Erin J. Campbell. 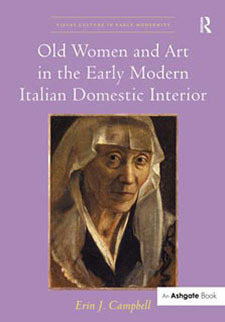 The author “describes a proliferation of portraits of old women in the second half of the sixteenth century in northern Italy,” arguing “that these portraits served to remind viewers of the duty of old women to model familial and civic virtue.” Read the full review at caa.reviews. 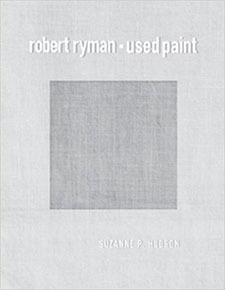 Dustin London reviews Suzanne P. Hudson’s Robert Ryman: Used Paint. The volume “documents the development of Ryman’s art from the early 1950s to the turn of the century” and “provides a thorough description and analysis of the variety of his approaches to painting.” Hudson “writes with eloquence and perspicuity to bring Ryman’s work to a wider audience on its own terms.” Read the full review at caa.reviews. Thank you everyone who made this 2017 Annual Conference in New York a lively and vibrant event. The CAA staff, board, and myCAA helpers spoke with as many attendees as we could and attended as many sessions as we could. From what we heard at the conference, through official feedback channels and informal hallway conversations, people had a good time and learned. Attendees felt challenged and invigorated by the discussions. That is all we can ask. We received positive responses to our themes of inclusion, problem solving, and feedback. 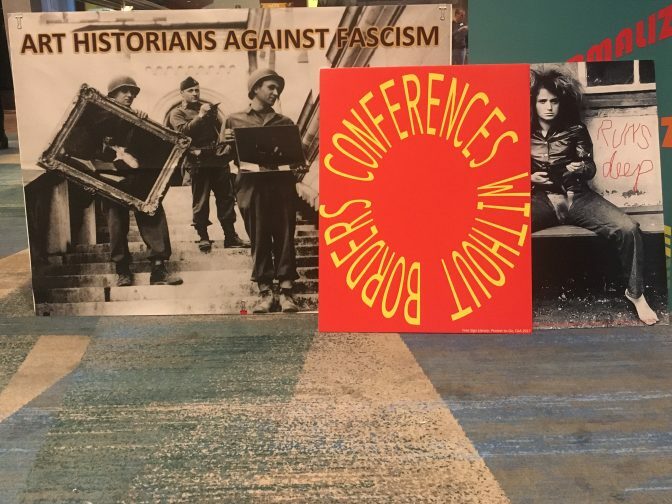 The shortened ninety-minute sessions were welcomed and attendees shared that the addition of more sessions on diversity and current politics gave the conference a much-needed vitality. 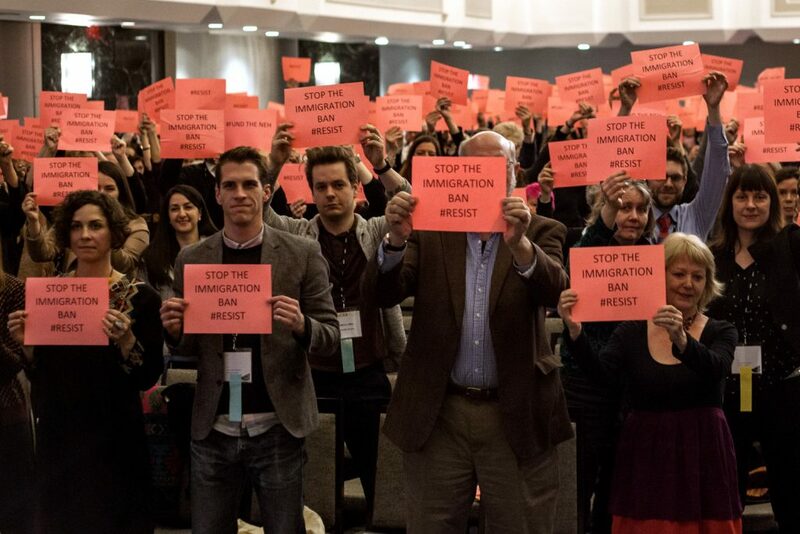 For our attendees, we hope that myCAA collectively felt like ourCAA. We look forward to carrying this energy and momentum into the 2018 Annual Conference in Los Angeles, February 21-24, 2018. There will be many, many more images to come in the next few weeks. But here are a few that we wanted to share right away.